27 year old Shaker Wahiyib al-Fahdawi a new face of evil. was previously detained by US security forces at southern Iraq’s Camp Bucca, before being sentenced to death and imprisoned in Salaheddin province in the north. After escaping from jail last year, Fahdawi went on the run. But in recent months he has attracted increasing public attention. In March, Fahdawi appeared in online videos reading a poem at a demonstration in Fallujah, after anti-government protests first erupted in his native Anbar province three months earlier. Authorities have since pinned the blame on him for a myriad of terror-related offences, with security officials in Anbar province placing a $50,000 bounty on his head. Little progress in bringing him to justice appears to have been made. 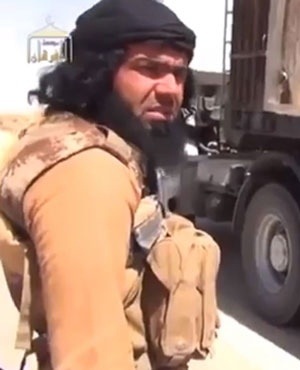 Just two months after footage emerged of him at the protest in Fallujah, Fahdawi was accused of leading militants in kidnapping 16 policemen along the Iraq-Jordan highway in Anbar province, leaving 12 of them dead and four wounded. ISIS destroys Christian churches and monuments in Ramadi, Iraqwww.examiner.comOn Monday, the Islamic State released a video on Youtube, celebrating victory in Ramadi, Iraq and destroying Christian churches and landmarks. Saudi Arabia strikes first in Middle East nuclear arms racewww.examiner.comSaudi Arabia and Iran are engaged in a "proxy war" in Yemen, with both sides recruiting allies to gain influence in the region. So, why do Saudi Arabia and Iran hate each other? University of Texas reports three mumps cases in two weekswww.examiner.comShawn Ciecko MD talks about the causes mumps and what the head neck symptoms are with mumps. He also talks about the risk for infectious growth of a tumor with mumps. DHS secretary warns of possible lone wolf attacks in Americawww.examiner.comAs ISIS and other terrorist groups pus their message through social media, federal officials warn that local officials must be vigilant for "lone wolf" attacks. U.S. military increase security due to threat from ISISwww.examiner.comFederal prosecutors said 20-year-old John T. Booker planned to drive a truck loaded with explosives onto a Kansas military base. Afghan courts sentence four men to death for mob killing of womanwww.examiner.comFour men in Kabul are sentenced to death for their role in the mob-killing of a 27-year-old woman. Islamic State massacres 300 Yazidi prisoners.www.examiner.comIn northern Iraq, hundreds of Yazidi girls and women freed by ISIL say they were raped and beaten while being held by the group.